Carriageworks is a special place for plenty of Sydney artists, but the performing and visual arts venue has a very specific connection to Thom Roberts’ work. Roberts personifies trains as people and people as trains. 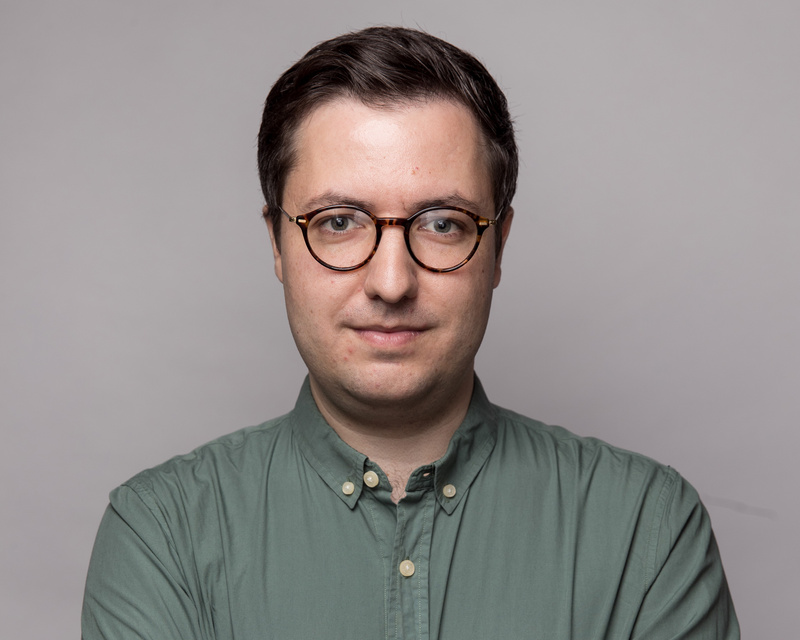 He’s worked across mediums and styles – including animation and live performance – but he’s best known for his portraits of trains and people, with multiple eyes, multiple noses, or cast by Roberts as Sesame Street-esque characters. They’ll be displayed at Carriageworks as part of the National 2019: New Australian Art, an ambitious biennial exhibition that also runs at the Art Gallery of NSW and Museum of Contemporary Art from March 29, 2019. Prints of Roberts’ portraits will be hung on the billboard that sits at the front entrance for Carriageworks, with paintings of people on one side, and paintings of their train counterparts on the other. 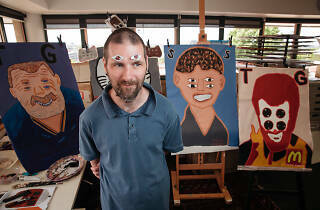 Roberts is one of the artists who works out of Studio A, a supported studio in Crows Nest for professional artists with intellectual disabilities. It sprung out of Studio Artes, an organisation that has been making the arts accessible for adults with disabilities since 2000. But while Studio Artes provides training and creative programs to around 190 people, Studio A is all about professional development for a smaller group of artists, helping them to overcome the barriers they might face in seeking artistic training and careers as professional artists. “No matter how much I say ‘they’re really talented’, there’s a very common assumption out there that it’s art therapy and can only be art as recreation,” Mordy says. An artist herself, Mordy had never planned on working with people with disability. But when she volunteered at Studio Artes about a decade ago, her career suddenly changed direction. Studio A exists to fill that gap and ensure artists can earn an income from their work. Most significantly, the staff assists the artists with all the administrative work that’s necessary to have a career in the arts world. It’s made a significant impact upon the lives of the artists, one of whom was previously working for $3 an hour, packing dog collars into boxes. That was considered a fair wage and a successful outcome of an employment program for people with disability. The artists who work at Studio A are now earning an income commensurate to working artists without disability. Key to that success is Studio A’s individualised approach for each of the artists, who are all given a marketing plan and mini-business plan that fits each of their talents and interests. In addition to his painting, Roberts recently collaborated with physical performance company Erth, and Studio A artists Meagan Pelham and Skye Saxon, on Birdfoxmonster, a multi-sensory dining experience commissioned by Carriageworks that combined digital art with sound, performance and food. 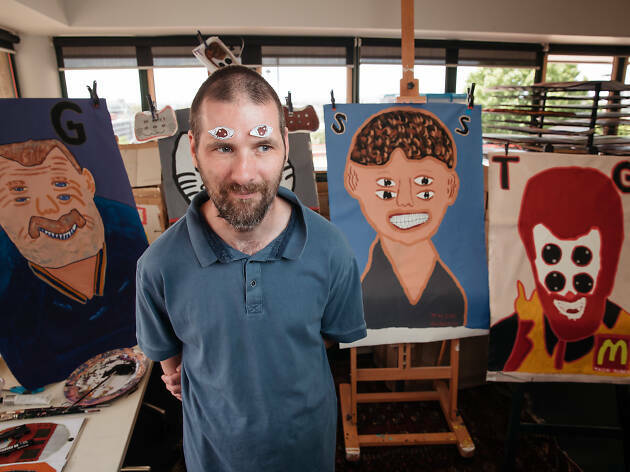 Another Studio A artist, Greg Sindel, is a published graphic novelist and has just travelled with Roberts to Canberra to perform backstage for artists at Spilt Milk Festival, making live drawings of the artists’ superhero or villain alter-egos. But some of the artistic endeavours are more traditional. Emily Crockford recently painted a 39-metre mural for Westpac’s service centre in Concord West, and you might recognise her paintings of the Sydney Opera House from expanses of wooden cladding installed around City of Sydney construction sites. Daniel Kim, an artist with a more representational style, who enjoys creating photo-realistic work of just about any subject, gets most of his work from commissions, including portraits of corporate CEOs and Ministers. You can see Thom Roberts' work at Carriageworks as part of the National 2019, from March 29 to June 23. Check out the best art in Sydney this month as well as 12 accessible attractions across the city.